As summer arrives, Texans collectively begin the annual rituals: backyard barbecues, trips to Barton Springs, lively complaints about the heat. And another event takes place. After their winter hibernation, amusement parks are back open for business, and crowds swarm through the gates; an army of adventurers, ready for thrills! 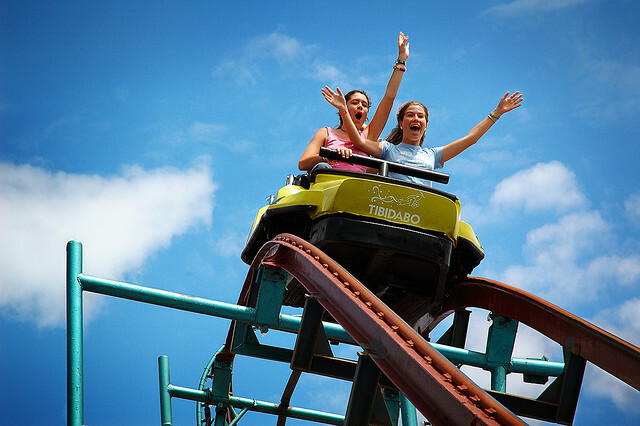 This same montage of sights and sounds lives in the minds of us all; we can’t help but equate “amusement park” with “summer” and “sun” and “heat.” In this week’s Unbound feature, seventh-grade writer Saskia eloquently states the allure of the roller coaster and all its horrifying delight. Her careful exploration of our almost fatalistic fascination with these steel dangers evokes our deepest fears. But then we come back to earth. At the end of the reader’s journey, we find the life-affirming power of her final sentence. Just enjoy the ride! The air is cool and light, but it won’t last long. We board the stuffy bus, with its scratchy fabric seats and windows that creak loudly when you open them. No one is quite awake, and if they seem like they are, they are running on adrenaline. There is the anticipation of excitement, and it hangs in the air through the light conversations on the bus. Two hours of half-sleeping on the ride, and finally we are there. One by one, we are off the bus and into a new area of excitement; screams and bright colors fill the atmosphere. A roller coaster delivers a group over a tall hill in the distance; you can hear them scream bloody murder as they go down, lightning fast. You get to your first roller coaster. You sit on your cold metal and plastic seat, and you feel scared. You get that weird feeling in your stomach, and you grip the metal bar in front of you so hard your hands are pale. Then you are off, slowly climbing to the top of an incredibly tall hill, and then you’re at the top. You think you’re going to die. You smell metal and plastic, and you find yourself screaming louder than you ever thought you could. The car is rattling loudly, and you can see for a mile. Then suddenly you are at the bottom. The relief rushes over you. You survived, you’re alive.